Rob White produced a brilliant batting display as Old Northamptonians bounced back from the loss to Horton House in style. White lashed a sensational 140 from just 72 balls, including 22 fours and five sixes, as ONs cruised to a nine-wicket win at Geddington. Thomas Hafil (63no) was also in the runs for ONs, while Tom Heathfield took three for 52 as Geddington were limited to 227 for seven. And it was no problem for the away side as they hunted down their victory target in just 23.2 overs, moving back above Finedon Dolben at the top of the table. Saints were also easy winners as they cruised to victory against Wollaston. Mark Wolstenholme (3-28) and Nick Bell (3-29) helped to do the damage as Wollaston were restricted to 181 for nine from their 50 overs. And Saints made light work of the reply, with Emilio Gay (78no) and Charlie Home (35no) getting their team across the line in 29.4 overs. Horton House were unable to back up their fine win against ONs as they were beaten by four wickets at home to Brigstock. Elliott Ruff hit 30 for Horton but the batsmen struggled as just 162 all out was posted. And despte the best efforts of Andrew Neate (3-21) and Ben Wall (3-28), Horton could not stop their opponents from claiming the victory. Callum Guest hit an impressive 56 not out for Brixworth, but they lost by seven wickets at home to Oundle Town. Brixworth were all out for just 152 and though Harry Penberthy took two for 42, Oundle were comfortable winners. In division one, East Haddon earned a fantastic 131-run win at Overstone Park as Faisal Khaliq impressed with the bat and ball. Khaliq took three for 21 as Overstone were all out for just 124 in reply, having earlier hit 47 in Haddon’s 255 for nine. Ed Smith top scored with 54, with Daniel Adams (3-27) and Charles Edwards (3-51) doing well with the ball for Overstone. Daniel Hill delivered a superb unbeaten 121 as Old Northamptonians IIs beat Irthlingborough Town by three wickets. Nicholas Cooper had earlier taken three for 36 as Irthlingborough made 272 for eight, which wasn’t to be enough. Jarrod Pretorius hit an unbeaten 62 and Tom Moore made 52, but Stony Stratford lost by 77 runs to Isham. 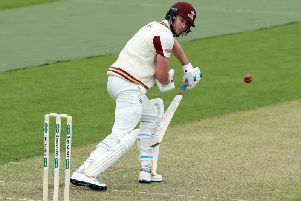 Stony were all out for 193 in reply after Dean Bryce (3-38) had helped to limit Isham to 270 for six. Premier Division: Horton House v Geddington, Old Northamptonians v Brixworth, Oundle v Peterborough, Rushden v Northampton Saints, Wollaston v Finedon Dolben. Division One: Burton Latimer v Overstone Park, Desborough v Wellingborough Town, East Haddon v Old Northamptonians IIs, Irthlingborough v Stony Stratford, Loddington v Isham, Weekley & Warkton v Kettering. Division Two: Finedon Dolben IIs v Kislingbury, Great Houghton v Thrapston, Long Buckby v St Crispin & Ryelands, Northampton Saints IIs v Rothwell, Old v Wellingborough Indians, Peterborough IIs v Earls Barton. Division Three: Brixworth IIs v Old Grammarians, Geddington IIs v Great Oakley, Heyford v Wollaston IIs, Irchester v Rushden IIs, Stony Stratford IIs v Horton House IIs, Weldon v Oundle IIs. Division Four: Old Northamptonians IIIs v Higham Ferrers, Overstone Park IIs v Raunds, Podington v West Haddon & Guilsborough, Rushton IIs v Kempston, St Crispin & Ryelands IIs v Finedon Dolben IIIs , Wellingborough Town IIs v Bowden. Division Five: Bedford Town v Bold Dragoon, Carrib United v Cogenhoe, Kettering IIs v Northampton Saints Grendon IIIs, Stony Stratford IIIs v Harlestone, Thrapston IIs v Weekley & Warkton IIs, Yelvertoft v S&L Corby. Division Six: Earls Barton IIs v Spencer Bruerne, Isham IIs v Wellingborough Indians IIs, Rothwell IIs v Podington IIs, St Michaels 74 v Burton Latimer IIs. Division Seven: Gretton v Loddington IIs, Overstone Park IIIs v Desborough IIs, S&L Corby IIs v Bugbrooke. Division Eight: Bowden IIs v Old Northamptonians IVs, Horton House IIIs v Long Buckby IIs, Mears Ashby v Oundle IIIs, Old Grammarians IIs v Barton Seagrave, Raunds IIs v Hardingstone. Division Nine: Brixworth IIIs v Heyford IIs, St Crispin & Ryelands IIIs v Irchester IIs, St Michaels (N) v Wollaston IIIs, Wellingborough Town IIIs v Weldon IIs. Division 10: Cogenhoe IIs v Rushden IIIs, Finedon Dolben IVs v Brigstock IIs, Geddington IIIs v Overstone Park IVs, Kettering IIIs v Weekley & Warkton IIIs, Kislingbury IIs v Harlestone IIs. Division 11: Bold Dragoon IIs v Horton House IVs, Hardingstone IIs v St Crispin & Ryelands IVs, Irthlingborough IIIs v Thrapston IIIs, Old Northamptonians Vs v Burton Latimer IIIs. Division 12: Bugbrooke IIs v St Michaels 74 IIs, Obelisk Kingsthorpe IIs v Brixworth IVs, Old IIIs v Mears Ashby IIs, Old Grammarians IIIs v Grange Park, Spencer Bruerne IIs v Barby IIIs. Division 13: Barton Seagrave IIs v West Haddon & Guilsborough IIs, Isham Zingari v S&L Corby IIIs, Northampton Saints Grendon IVs v Kettering IVs, Thrapston IVs v Geddington IVs, Weldon IIIs v Stony Stratford Vs.